The Third Annual Zócalo Public Square Book Prize is made possible by the generous support of Southern California Gas Company. President Barack Obama opened his inaugural address in January by reminding Americans “that what binds this nation together is not the colors of our skin or the tenets of our faith or the origins of our names.” He went on to quote from the Declaration of Independence. But at Zócalo Public Square, we believe that the ties that bind Americans—to one another and to their communities, local or national—are not simply 200-year-old ideals but also new and ever-changing habits, associations, and rituals. That’s why we think it’s so important to bring people together, in person and online, to examine big questions. And that’s why, for the third year in a row, we are honoring the nonfiction book published in the past year that, in the view of our judges most enhances our understanding of human connectedness and social cohesion. The books we considered for the Third Annual Zócalo Book Prize explored central topics such as how community is affected by technology and partisanship and seemingly off-beat subjects such as how social cohesion is encoded into our brain chemistry. Whatever their differences, the authors of these different books were in agreement—with one another and with Zócalo—on one thing: community matters. Friday, May 3, 2013, 7:30 p.m.
Detroit—and the images it evokes of urban apocalypse, racial strife, and post-industrial decline—has become a symbol of everything that was wrong with 20th-century America. But in the past few years, it’s also become a fashionable petri dish for experiments in urban renewal. Pundits call our contemporary political divides a product of our times and our culture, with modern technology exacerbating our disagreements. But we’re also wired to perceive our own views as right and reject the reasoning of others, particularly of those not from our own tribe. For most Americans, the phrase “Main Street” conjures up a specific place, even if it’s somewhere we’ve only visited in books and movies—a small town of white picket fences and independently owned shops, a community where everyone goes to the same church and greets one another by name. 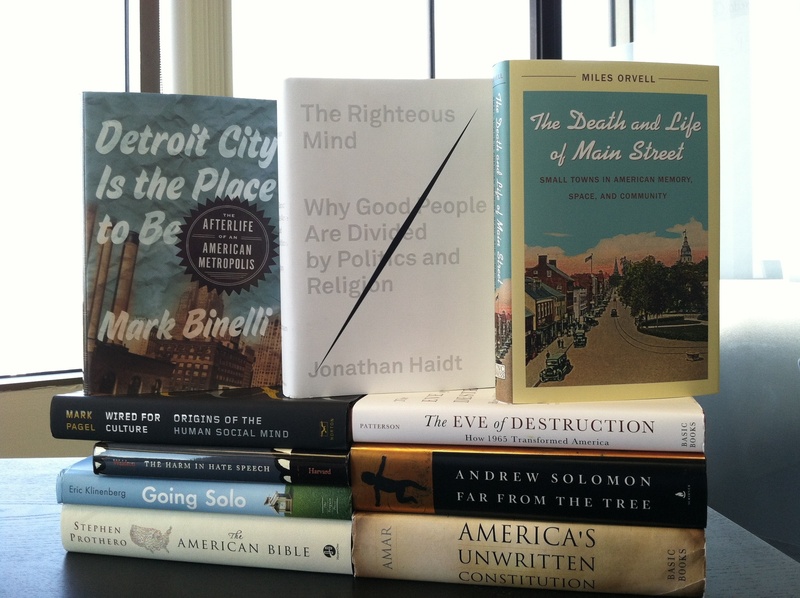 We are also pleased to announce our distinguished longlist. The authors of these excellent books—scientists, historians, religious scholars—explored community writ as large and long ago as the Old Testament, and as small and recently as today’s micro apartments. Read about our 2012 winner, Richard Sennett for his book Together: The Rituals, Pleasures and Politics of Cooperation and about our 2011 winner, Peter Lovenheim for his book In the Neighborhood: The Search for Community on an American Street, One Sleepover at a Time.